Standard - €142.99 Only 8 left! What is it about spiders that make human minds spin? They have been inspiring fear, inspiration, and a little bit of awe for all of our history. They are in nursery rhymes, scaring little girls and crawling up spouts. They take up major roles in ancient mythology throughout the world. In the Native American Hopi culture, all the living creatures of the world were created by the goddess Spider Woman when she paired up with the sun god. With their ability to create webs, spiders have been woven into tales with mostly positive connotations. But even with all these positive ideas, let's not kid ourselves. We all know that if we ran into a giant spider, we'd run as fast as our little legs would carry us. We wouldn't be thinking of the wonder of the web or the graceful nature of these eight-legged animals. We would be wondering how long it'll take to seal up the doors and windows of our houses until we know that someone has taken that monstrous arachnid out for good! At fifty-one inches tall and one hundred-thirty-two inches tall, this is no itsy bitsy spider All you need to do to make your yard into an arachnophobe's nightmare is plug it into an AC outlet and turn it on. 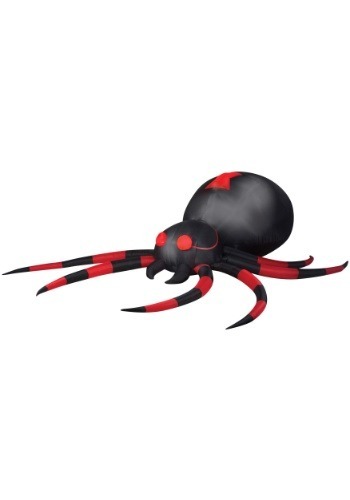 The spider lights up so that your trick-or-treaters can get a good look even when it's dark outside. It has tethers and stakes so you don't have to worry about you creature escaping in the autumn wind. Just make sure little Miss Muppet knows about your new companion before she comes over for her curds and whey. If you're looking to become the spookiest house on the block, look no further. Ghosts and ghouls are nothing to this red-eyed spider. Drape classic spider web material over bushes and trees to make your arachnid feel right at home and finish the look. This Halloween, get ready, you just might catch a few thrill seekers in your wicked web!